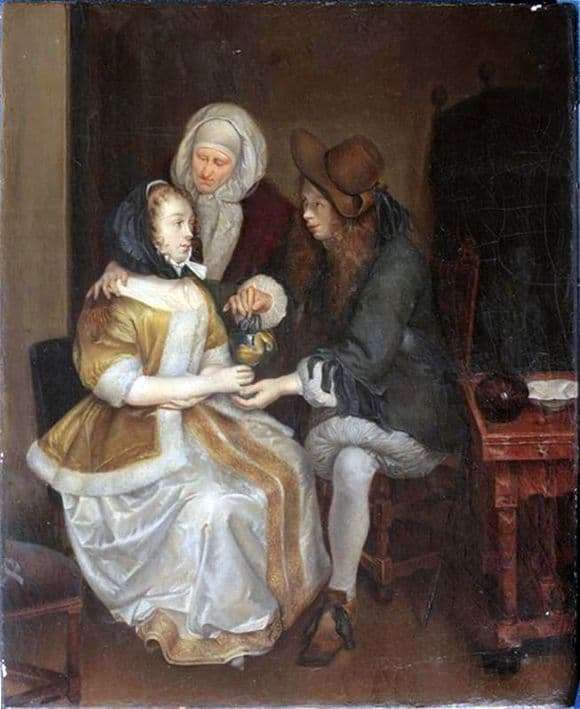 This painting is one of the best works of the artist, which shows the most remarkable traditions of Holland at that time. This work has no drama, it is calm, measured, devoid of any movement and is fully focused on the relationship between boys and girls. The young gentleman who offers a lady a glass of lemonade is very gallant, as sweet as their delicate contact, looks. They fully understand each other. There is a silent dialogue between them. This is quite a romantic scene, the young man caring for a girl, he carefully sat down beside her and gently touching his hands offers lemonade. Nearby seems to be a nurse or maybe some kind of relative. Most likely the young lady is unwell. Terborch very talentedly described the elements of clothing. Visible fur coat, trimmed at the edges, dress, Sewn from fine noble fabric. All this gives a rich girl, a gentleman looks like a dandy who cares about his appearance too much. It is seen that the gentleman is very young.